You’ve picked out the planting site and decided on the species and cultivar. You’ve been to the nursery, purchased the new addition to your landscape and brought it home. You’ve planted it. You now have an investment that literally will take a little while to grow. The tree looks strong and healthy. You’d think it doesn’t need any care right now. In fact, this is the best time in the tree’s life to begin a program of proactive care. Taking care of trees when they are young will assure a good growth form and prevent structural problems with the trees while they grow. An active program will help manage pests, too. Early preventive treatment will help to assure a long and healthy life. Beginning a program of care at first planting reduces lifetime costs and the necessity for many corrective procedures later in the tree’s life. Expert arborists recommend some of these standard practices for young trees to get a new arrival off to a good start. • Root Collar Excavation: It’s most important in young tree care to remove excess soil near the buttress roots and the root collar of the tree to prevent disease. You should be able to just see the tops of the roots coming off of the main stem entering the soil. • Hydration: It’s critical for new transplants to have adequate water – especially under drought conditions. But, over-watering can be just as damaging. 1” of water is key throughout the season. Trees need 10 gallons of water per week per diameter inch of the trunk. Either an irrigation system or a low cost soaker hose with a water timer can maintain a regular schedule of watering and avoid over-watering. A soaker hose can be hidden under a layer of mulch. Mulching conserves moisture and adds organic matter to the soil that is beneficial. 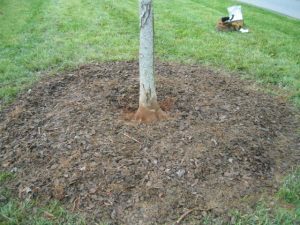 Make sure to keep mulch away from the root collar and avoid the practice of volcano mulching around the trunk. Only apply mulch 2-3 inches above the soil, ideally extending out to the drip line (at least 2-3 feet). • Fertilization/Soil Analysis: An application of fertilizer promotes the goal of rapid growth. Nutrients are added to the soil that may be lacking. Submit soil samples prior to fertilization to ensure that only needed elements are being applied. • Selective Pruning: Most shade trees have one central trunk. If the tree has more than one, then the crown should be corrected by pruning away the defect. A strong central leader should be left intact, and any other defects like v-crotches should be corrected. No more than 33% of the crown should be affected at one session. That may mean pruning in several sessions over a period of time. Limbs that compete with the central leader should be reduced in length and removed the following year. • Structural Correction: Any guy wires should be monitored to determine if structural corrections are achieved (usually after 1 year). Then they should be removed or adjusted so that they won’t damage or girdle the trunk. • Insect and Disease Inspection: Regular inspections may reveal pest and disease problems. Damage from insects and disease may not be obvious. These problems often occur in higher branches and can’t be seen easily from the ground. When discovered, any necessary pest and disease management techniques should be applied before damage reaches irreversible levels and severely affects the health of the tree. Nearly all young trees need some kind of early maintenance. Not all of them need to have every procedure. It takes time for a young tree to grow old, and a program of proactive care for necessary maintenance will set it on a path for a long, healthy life. Austin Proctor works in the Raleigh office of Bartlett Tree Experts. You may contact him at 877-BARTLETT (877-227-8538) or www.bartlett.com.